Please join us in congratulating Melissa Carroll as our latest e mployee of the quarter! Melissa was placed into a role at a top client’s Human Resources Consulting Department in January 2017. During her tenure there, Melissa has had the opportunity to work with multiple Managers and Team Leads, on several different projects. The feedback from each Manager and Team Lead has been nothing short of stellar. A Vice President that she had been supporting on one of the projects shared "Over the past six months, I have relied upon [Melissa's] contribution and dedication to the future of our team. [Melissa] has impressed me time and time again and I am so thankful to have had [her] on this project. I know this project has been all consuming and [she] has worked long days and nights and weekends... thank you, Melissa for everything!" Another manager added "Melissa [has shown] a great deal of initiative, follows through on all critical matters and is very thorough with her deliverables." 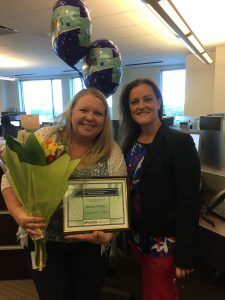 "Melissa has continued to prove to be a consummate professional, going the extra mile to get things done," said Crystal Connelly, Director of Sales for Sparks Group. "It was a no-brainer to nominate her for Sparks Group's Employee of the Quarter!"